When your athlete is involved in any sport, parents and coaches want to be as supportive as possible. You do everything — your drive your budding athlete to practices and games, lug around gear and sprint for pizza after a game. It’s all for the love of the athlete. It doesn’t take a super-parent to be a coach or team manager and fulfill that coach-arenting role. In youth sports just about anyone can do it. It takes compassion, enthusiasm and a willingness to make participating special and fun for the kids. With a bit of creativity and strong leadership, you can create a happy team on and off the field. 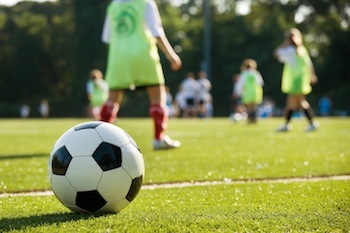 At the same time, jumping feet first into leading a youth sports team can seem overwhelming. Getting other parents involved, making sure all the kids are safe and having fun while balancing your family’s needs—all parts of the “job” — can be fulfilling and yet also demanding and stressful. All too often, the importance of winning a game overtakes the experience of having fun. Worst of all, kids being pushed to the limit suffer injuries and don’t return to the sport after recovery. The game becomes more about winning and less about bonding and working together as a team. Winning is fun, but it is not the most important thing. Have you ever gotten pizza with your athlete’s team after a game? By the time the pizza arrives, you would never know if they had just won or lost — they’re just kids having a great time. Helping kids build confidence and self esteem as a personal accomplishment, no matter the game’s outcome, is what makes a volunteer coach or manager job so important and rewarding. So how do great coaches do it? How do they help their players improve fundamentals like speed and passing while still maintaining the spirit of teamwork and fun? How do super team managers create a positive, supportive culture that is enjoyable for all? How do they keep parents involved without spending hours each week on the phone or typing out long emails? Finally, and most importantly, how do they do all of this as a volunteer with limited free time? Remember why we’re all here: to develop youth by building the right culture, and to have fun! Follow TeamSnap’s three-part series on how to build a successful team on and off the field. One of the foremost concerns of any adult leading youth sports is making sure the kids are having fun. For everyone to achieve the fun factor, everyone should be on the same page. By communicating clearly, listening to one another and always treating each other with respect, the entire team is guaranteed to have a good time. If it’s obvious someone isn’t having fun, find out why. Never just assume the situation will work itself out. VJ Stanley, a college and high school hockey coach who went on to coach multiple other youth sports, wrote a book about helping children get the most out of youth sports, “Stop the Tsunami in Youth Sports: Achieving Balanced Excellence and Health While Embracing the Value of Play for Fun.” Stanley’s number one piece of advice to parents? “Youth sports are supposed to be fun because play is an integral part of children’s ability to grow, learn life skills and everything.” Seventy percent of children playing youth sports at the age of 10 quit by the age of 13. He believes this happens because the child feels too much pressure from the coaches and parents, and it’s not fun anymore. They are not mini-adults. They are not pros in training. Only one percent of youth athletes will go on to play Division 1 college sports, and far fewer still make it to the professional ranks. It’s more important, Stanley explained, to make sure you child is learning life skills, like how to be a team player. His philosophy when it comes to team leadership remains simple. “Have it kid-oriented,” Stanley said. “Let the kids play for fun, let them scrimmage together, pick up games during practice where you’re not coaching.” It can be easy to get caught up in dreams of bright lights, when in reality, the focus needs to be on setting realistic tangible goals. There is a real difference between dreams and goals. And the main goal is to play and have fun. A child’s first learning experiences are play-based and studies have shown that play-based learning is critical in brain development. Develop your child as a child, not just as an athlete, by letting them play! So what else? There are certainly other rules to follow to help build a successful team on and off the field. Come back for Part II and III in the next week for more ways, including how to keep other moms and dads on your team happy.